In an effort to be "green" (and cost effective) since having Son 2 I have been using washable breast pads so I don't have to keep buying disposable ones. I have suffered from every ailment common to breastfeeding women, the worst being more or less constant thrush both in Son 2's mouth and on my skin. I think the problem with the washable pads is that they aren't very absorbent so I was constantly damp which is a breeding ground for thrush. I was keen to try something new and noticed LilyPadz on another blog. Anyway the kind people at www.simplylily.co.uk sent me some lovely LilyPadz and cleaner to review! I was very pleased as I love receiving things for review that I desperately need! On opening the package I saw there was a very useful set of instructions and information. The pads themselves are made from silicone and unlike most breast pads, do not actually soak up milk but prevent the leakage from happening in the first place. The idea is that there is a pressure exerted which stops the letdown reflex. LilyPadz have to be cleaned either with soap or water or you can buy a cleaner like the one pictured below. The LilyPadz come inside a nice plastic case so you can easily pack them if you were going away or slip them inside your changing bag knowing they won't get damaged. The LilyPadz are actually quite sticky so they can stick easily to your skin, and come stuck onto a plastic dome, I assume so they don't stick together. It is probably worth keeping the plastic dome for in between use. It is easy to remove them from the dome. This is what they look like once they are removed from the dome. The idea is that you turn them inside out and then place them on the breast, you need to make sure they are fitted securely and snugly to the skin. I found after a while I didn't need to turn them inside out but simply placed them on the skin. I honestly forgot I was wearing them as they are so comfortable and I can say that it is true I don't have any leakages when I have them on (no idea how this works!). One of the best things about them is that you don't need to wear them with a bra so for example at night (which let's face it is one of the worst times for leakages) you can ditch your uncomfortable sleep bra or vest and just wear normal PJs. There was also the point on the instruction sheet that they can be used for swimming or wearing under a bathing suit. This is a really good point as when we were on holiday I had to wear breast pads under my bikini which then got wet when I went swimming, most unpleasant. All in all I really like them and thoroughly recommend them. In balance I suppose the only negative would be if they lose their stickiness, but I haven't been using them long enough for this to happen. I'm also wondering about keeping them after I stop breast feeding for wearing under dresses and tops if I want to go bra- less! You can buy Lilypadz from Boots for £15.31 Mothercare for £14.99 and Jojo for £15. This might seem a lot but actually works out more cost effective and more environmentally friendly than buying disposable breast pads. They are also far more comfortable and convenient to use. 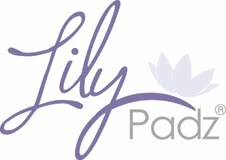 If you would like to win a pair of LilyPadz, please follow this link to their facebook page to see details of the competition!